This post is slightly different from my usual posts. What if we were to think of grammar for a while? More specifically, I’d like to write about verbs in English and how to teach them. Now, if you’re not into grammar, I hope I’ll see you around for my next posts. If you’re curious about one of the things I may ponder grammar-wise, I hope you find this enjoyable and worthy of your time. The point is that we spend years and years talking to students about the form of the verbs in English, and we may even contrast them at times, but we don’t really get to the point with them. What I’ve learnt is that we don’t have to dumb things down for students and simply assume they won’t be able to do the math on their own. What if we tried to find ways to teach them about the core meaning of each one of the different aspects of English verb? Once they understand the meaning of each one of the aspects, it’s quite easy for them to understand the use of the verb forms when they match tense and aspect on their own. This kind of teaching, in my view, should be done from as early as possible. Not only will you be treating your students fairly by not dumbing things down, but you’ll be giving them a chance to realize that they are able to understand, for instance, the continuous forms – present, past and future – pretty much at the same time. When we don’t do this, I’m under the impression that they struggle a lot trying to understand each one of the forms in isolation as they feel they are learning something from scratch. This is exactly where the problem lies. By being introduced to the core meaning of each one of the aspects, and being aware of the idea of time (I honestly can’t see people having problems with this), students may find it quite easy to put the sentences together on their own. This might be an issue for me only, but I really dislike seeing exercises where students are asked to “fill in the blanks with the present perfect tense”, or “fill in the gaps with the appropriate verb tense”, but what students actually have to do is use a combination of tense and aspect, i.e., a verb form. The question that I ask myself is whether the teacher who’s created such exercise: a) doesn’t share the view of the whole tense x aspect explanation above; b) doesn’t know that there is such a thing; or c) knows about it, agrees with it, but doesn’t believe that students are capable of understanding the matter. If the answer to my question above is a), I’m actually fine with it. I mean, if you just don’t agree with this or that, and as long as you are able to demonstrate that you’re right, then I’m fine with it. What you shouldn’t do is, on the grounds of “my students don’t need to know this”, justify your lack of knowledge. If we care about meaning, why do we resist teaching our students about the meaning of the one things they seem to struggle so much with in learning English? We do we find it so hard to look at grammar not as a multitude of rules, but as something that will end up fostering communication and not hindering it? The key is knowing how to address it, I suppose. So, what is your view on the matter? 1. Huddleston, R. and Pullum, G. K., The Cambridge Grammar of the English Language, CUP, 2002. 3. Biber, D. et al, Longman Grammar of Spoken and Written English, Pearson Longman, 1999. 4. Thornbury, S., How to teach grammar, Longman, 1999. I loved it, but I guess I have a silly question. What about the future (will and going to) aren’t they examples of tense as well? They might not have inflection, but is it inflection that determines tense? Awesome post Henrick!!!! The simple answer is, yes, it is inflection that determines tense. Obviously, English speakers understand the idea of the future time, but they make use of: a) WILL – a modal verb to express the future, not a tense; b) BE GOING TO – a periphrastic modal, or just a phrasal modal expression; c) PRESENT SIMPLE; or d) PRESENT CONTINUOUS. As we can see there are 4 different possibilities to express the future time, but not a future tense per se. This is a something that the three grammar books I mentioned above agree with – the lak of the future tense in English. 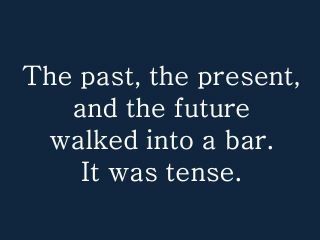 Honestly, the very first time I came across this, I was rather shocked as all my teachers had always taught me the future TENSE. Well, I guess I was a bit tense when I first came across the right information, but now it’s all clear. Oh, and the idea of the need of an inflection for you to have a tense is also true for Portuguese, for instance. If there’s no inflection, it’s not a verb tense. Never thought about it this way. Future, regardless of inflection, is indicated by (will, or going to). Maybe, the language is poorer morphollogically than Portuguese, but it has these two constituents that indicate future. Let me try to analyze them, and please correct me if I am wrong. “will” is a free morpheme, a lexical word, ä modal that indicates future, and going to is composed of a free lexeme “going” and a dependent morpheme “to”, which along with verb to be, also express future. My idea is that these two constituents indicate future because they carry this future content in their formation. I guess it all comes down to definitions, but we look at 3 tenses: past, present, future and then forms within those tenses. It seems more intuitive for most students to grasp and relate to in the world (as an example, philosophically speaking, there isn’t really a “present” is there since life has either happened or is going to happen, however closely in the future). Well, I guess everything comes down to definitions, right?! The problem is being able to support your position and, depending on the definition you’re trying to come up with, the more support you’ll need to make sure your argument stands. For instance, and obviously exaggerating it, if I decide that from now own my definition of what a hair is is actually what others consider to be a table, then it’s all a matter of definitions. However, I guess the post clearly helps me support my view that there aren’t 3 tenses. There are only two verb tenses. Even though I do concede that some might find it more helpful for learners to teach the future as a tense, I don’t share that view. Some people find it easier to teach past modals by saying that it is the modal followed by the present perfect – I don’t. What might seem more intuitive at first may actually hinder progress further on account of fossilization. As I mentioned in the text, I don’t think students need to know it as teachers do. What I don’t think that is fair is for us to teach them something we know to be wrong on account of our belief to be making things simpler. What if this student becomes a teacher later on? As learning is a lot more complex and chaotic than we may want to assume, simple things such as this might either not mean a thing for some, but they might make things more complicated for others. My suggestion, and solution, is to only address this issue as it is later on. When students are first introduced to the future, well, I just call it “the future” – I just omit the word tense. This seems to be a very easy solution to me. I’ve seen students struggling with the use of gerunds as subjects simply because they learned that the present continuous is formed with BE + GERUND. I’m not sure the teacher didn’t know the difference between gerunds and present participles, but later on, talking to the student in his L1 and getting him to explain exactly what he understood, I was very much under the impression that his difficulties arose from the fact that gerunds were verbs and could never be used as nouns. How often do we over-simplify for the right reasons and how often do we do it for the wrong reasons? Well, I guess everything comes down to definitions, right?! The problem is being able to support your position and, depending on the definition you’re trying to come up with, the more support you’ll need to make sure your argument stands. True! So I’d love to find what a true, objective meaning of ‘tense’ is. A search online suggests that 90% of the grammar sites see tense related to time and thus 3 tenses. As you mention, some people go further and talk about 12 tenses (personally 9 too many for me but that’s my pov). And some people talk about 2 tenses. So if a definition is by consensus that is one thing, but if there’s a true objective definition of tense then where is it and where does it come from? Well, I must admit I can’t go as far as citing that 90% of the grammar sites say this or that – I honestly don’t have such information, but I appreciate the number. However, I’m not sure we can assert that these sites have been written by language experts, though I may even concede to them having been written by language teachers. Yet, when I see many (and I really can’t state the percentage) site addressing issues such as the present continuous being formed by TO BE + GERUND, for example, this doesn’t mean I need to assume they’re right. The sources I take into account have been mentioned and hyperlinked to in the text, including the page numbers in case you’d like to do your research. In my humble opinion, these are trustworthy sources from language professors with years of experience teaching in some highly respected universities. In addition to that, their work has been supervised, edited and revised. For instance, the Cambridge Grammar of the English Language has, in its writing team, professors from the following places: University of Edinburgh, University College London, University of Reading, University of Queensland, University of California, School of Linguistics and Applied Language Studies, Northern Illinois University, University of Cambridge, University of New South Wales, The Hebrew University of Jerusalem and Stanford University. From a structural point of view, English verbs are inflected for only two tenses: present and past. However, many verb phrases are not marked for tense. First, tense is not marked for imperative clauses and non-finite clauses. Beyond that, finite clauses can be marked for either modality or tense, but not both. Thus the presence of a modal verb precludes tense marking (although modal verbs sometimes express time distinctions). Verb phrases which are marked for tense, not modality, will be referred to as tensed. As noted above, there is no formal future tense in English. Instead, future time is typically marked in the verb phrase by modal or semi-modal verbs such as will, shall, be going to. One of the most obvious respects in which we have departed from traditional grammar in this book is that we do not recognise a future tense for English. Traditional grammar treats will as a future tense auxiliary, proposing a tense system with three terms (past, present and future). The view taken here, by contrast, is that while there are numerous ways of indicating future time, there is no grammatical category that can properly be analysed as a future tense. More particularly, we argue that will is an auxiliary of mood, not tense. Right after this, there is lengthy explanation against the traditional analysis that states that the future is a tense. Before studying tense and aspect, I taught and said 3 tenses myself. Nowadays, I work with time, form, meaning and the message instead of form/rules, also working much more on developing students awareness on context. It is hard to switch students into a healthier learning habit though. It takes a huge amount of time and patience. We may even notice that it is easier for some students to use grammar in a grammar exercise and often accurately, but fail to use it in real life situation. I have been thinking a lot also on that when comes to assess learning, if a student can fill an exercise more or less acurately but fail to use in real life interaction, how much of learning/ language development really took place? And what does it say about storing language in short-term memory X long-term memory, also related to assessment of lesson effectiveness. I look forward to your next posts, especially on how to teach them effectively taking into consideration what you just shared in this post about tense and aspect. Adding it to my blogpost list of grammar for further reading and reflection. Tks so much for writing this. One of the things that you mention struck a chord with me… it is, indeed, hard to switch students into a healthier learning habit. Not only does it take a large amount of patience and time, but it also involves on having all those who are dealing with the students to also switch into that new mindset. For instance, if you spend 3 hours a week with your students and you work with them by presenting form, meaning and use, but all other teachers around them do not really worry about this new way of looking into things, chances are they won’t really buy into the idea. This means that we should be trying much harder to change our co-workers and all those involved in the learning environment of our students to work together, cooperatively, and at least having an idea of what the teacher next door believes in. This is what makes change even harder to happen. I often hear teachers saying that they know it all and, therefore don’t need to share or exchange things with their peers. Obviously, they don’t use this kind of language and try to sound a lot more sophisticated, but this is the message that is conveyed. I love this post and agree with pretty much everything you have said. I remember reading ‘The English Verb’ by Michael Lewis years ago when I was doing my Dip and it compeltely blew my mind. It makes English seem so simple and clear, much clearer than course books would have you believe. The other book I read at the time that completely changed the way I view language and teaching was also by Michael Lewis: ‘Implementing the Lexical Approach’. No language teacher should enter a classroom without reading both of these books. One point you brought up was about exercises that are ‘fill in the blanks with a form of the verb’. I don’t know if you were referring to published course books or not, but from my limited experience the writer (unless he is one of the the stars of ELT) has very little say over what type of exercises to use. It is instead the editor/publisher who requests certain activities. So good to be able to read your posts again! The points you make and the question you ask, to whether we should teach the grammar, the core meaning of English verbs I have pondered and asked myself. As the learner of English that I am, once I learned these things it made things a lot simpler to me. But we have to be careful, because not all students (I’d venture saying students who would find such teaching something to facilitate their learning process would be a minority in my teaching reality) would be able to see it like that and grasp the concept. Not because they don’t have the necessary cognitive ability and/or maturity, but rather because they’ve been taught to process language (when studying it – let’s make it clear) in a certain way and it’s very hard to break that process. So while I see the benefit of teaching verbs the way you propose (and even have done so to a few groups and the eventual student here and there) I also think that at the point we are in language education it would backfire and make things more confusing for the students. They really do see metalanguage and learning about grammar as something purely theoretical and mostly on the opposite side of communication. Changing their mindsets would be the first step. So what can we do now? The only answer I see to this is… personalization. If we, as teachers, are able to identify the students whose mental processes would grasp it, we should teach them that way. I do see your point when you say that many students would, perhaps, fail to be able to grasp the concept. This is also something I feared, but I’ve been doing things like this for about 5 years now, and the results have been quite promising. Needless to say, we can’t just teach them all at once, but even when we’re still in the early stages and quite fragmented verb forms, I make a point of explaining it from this perspective. By doing so, I found out students had a lot less difficulty in understanding the past continuous as they’d already seen the present continuous, and had a pretty good idea of the core meaning of the continuous aspect. No, this didn’t make the magic happen to all learners, but even those who still struggled to come to terms with this, and who needed more “traditional” explanations were able to benefit from this way of explaining things when they got to a more advanced level and different verb forms were contrasted. Sometimes they themselves didn’t know they were able to see the difference. But then, what exactly is it that makes things go from clear as mud to crystal clear? What exactly makes things click? Now, yes, even though I’ve been doing this with levels ranging from A1 to C2, I’ve had more B1+ level groups in the past 4 years, so my opinion may be biased, I know. Yet, for all levels, what made the difference is exactly what you said: changing their mindsets! Personalisation is certainly the easiest way to move forward, but it might be a tad harder when there are 15 students in the classroom. Feasible, yes! Thank you for the complement to the post! To be honest, my intention was to go on about conditionals next – I’m glad to see you mentioned it in your comment. Perhaps someone felt that it would be a lot simpler to break language into manageable chunks in order to teach it. Or maybe breaking it down as such just made it more marketable. Who knows, right?! The fact is that once you become aware of how sensible things are, and how much simpler it might be, it does make me feel as if we’ve been patronising and damaging students instead of helping them out. My questioning actually goes a lot further – do all teachers do it because they honestly believe to be helping their learners (I’m OK with this), or do they do it for lack of knowledge (definitely not OK with this)? The problem with these, to quote Thornbury, grammar-McNuggets is that language becomes so fragmented that it’s actually hard to put the pieces together. I do go back to the proposition that language is a lot more like an organism, and not like a machine. And if we believe that language is much more than the sum of separate parts, it makes even less sense to simply avoid teaching it as it truly is. This doesn’t mean we shouldn’t break it down into manageable chunks, but I don’t see how we can be OK with fragmenting it so much and not explaining what the continuous aspect really means, and making it clear to students that the continuous aspect has the same core meaning for all times. As I mentioned in my previous post, it has consistently helped learners, in my experience. And this can all be done while still working within the students ZPD. Now, the problem lies in shifting away from this current paradigm, which is a lot harder to do when many teachers have learnt it like that and might be having a hard time unlearning what they’d once learnt. What if they stopped for a while and realised that what worked so effectively might have been the result of very strong motivation. After all, they liked studying the language so much that they themselves became teachers, right?! These people would learn it anyway. What about those who are not that interested and who struggle?